Mobile speech and data communications have become part of everyday life in all parts of the world. However, the provision of more sophisticated ‘tele-presence’ services requires a further quantum leap in research if we are to move forward from mobile phone technology. The Communications Group plays a key role in researching and advancing the necessary enabling technologies to facilitate this quantum leap, including the physical network and service layers, as well as their joint optimisation. Long-term research in the group focuses on communications and information theory. It provides ideas for more short-term, applied research, while directly appealing to industrial partners across the globe. Ad-Hoc Network - A "spontaneous" network with a wireless or temporary plug-in connections in which some of the network devices are part of the network only for the duration of a communications session or, in the case of mobile or portable devices, while in some close proximity to the rest of the network. 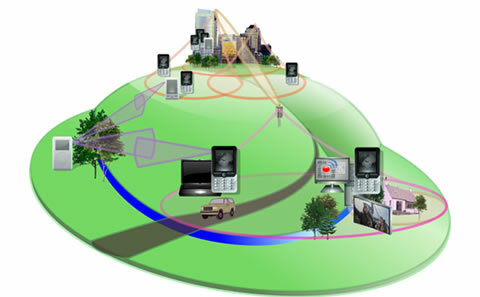 Next Generation Cellular Network - A conglomerate of emerging technologies, which will facilitate on demand high quality video, audio as well as high-speed data services. The NGCNs will likely to be based on Internet technology and run at speeds exceeding 100 mbps. The NGCN's objective is the achievement of the highest throughput, lowest cost wireless network possible. Media Gateway - Ultra high throughput point-to-point wireless link. A media gateway is a network element that delivers mutimedia and data content to the MAN/LAN access point. Wi-Fi (Wireless Fidelity) - is the popular term for a high-frequency wireless local area network (WLAN). The Wi-Fi technology is rapidly gaining acceptance in many companies as an alternative to a wired LAN. It can also be installed for a home network. WiMax Network - Worldwide Interoperability for MicroWave Access (WiMAX). WiMAX is a technology defined by the IEEE 802.16 working group. WiMAX basestations can cover a radius of up to 50 kilometers with line of sight access, but more realistically cover a 15 kilometer radius without line of sight.